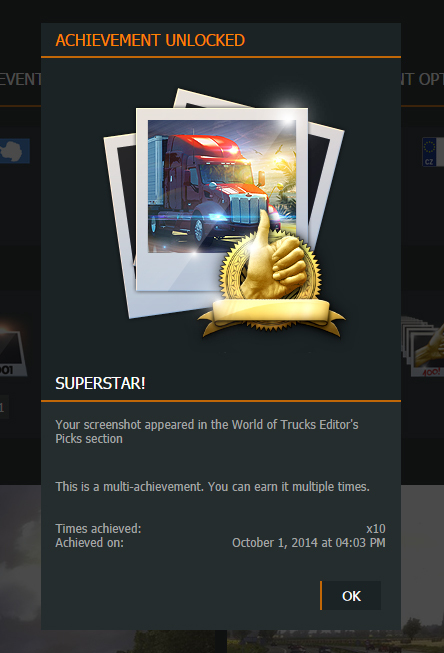 SCS Software's blog: It's time to check your personal World of Trucks page! It's been updated! It's time to check your personal World of Trucks page! 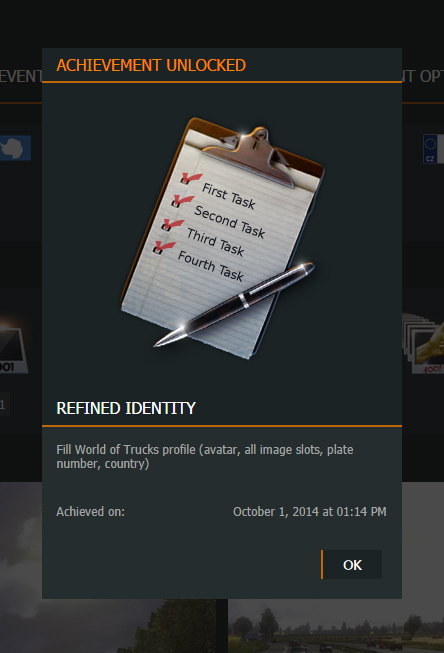 In our ongoing effort to enhance our World of Trucks service we have just launched World of Trucks Achievements. Current achievements set is primarily related to already existing WoTR features. Please log in to your account and check them out! It's highly likely you'll be able to get one or two with minimum effort right now. At first it may sound like nothing too special is going on, World of Trucks is still only a place for game screenshots and not much more. However, for us it marks a day of very important service code base integration that is getting built exclusively for World of Trucks. In case you haven't registered yet, any genuine retail or digital key as well as registration via Steam link will work (but only once!). Stay tuned for more news about World of Trucks evolution. With future updates, it should become clearer that our ambition is way beyond the current feature set - gameplay to be delivered through and inside World of Trucks! SCS, in my and other people's opinion, these are good things and improvements but you should concentrate your energy for primary targets of the game. In my opinion, you "waste" a lot of time working on a lot of projects (Euro Coach, American, Scandinavian, Paintsjob, Patch 1.14) and the waiting time is very huge. I think you should revise your corporate strategy. I also think the game needs to a new graphic engine because ETS' graphic begin to be obsolete. How can you call 2 new games, a massive DLC, and a new patch which adds a new truck to the game "wasted time"? The waiting time is not "huge", they take a while because they have to be made and then tested by us beta testers. Paintjobs are likely worked on by a seperate person or team who specialise in graphics, and so don't really do anything else. American Truck Simulator finally means that USA has an updated truck sim, the last one being 18WoS series. Euro Coach Sim, nobody has seen much from that... But both ATS and ECS have seperate dedicated teams working on them. As for the graphics engine, SCS are constantly developing it, and the fact that it runs on most computers built in the last 5 years is truly remarkable, and you should be f**king grateful. SCS corporate strategy is simple and the same as every other company... make money. If we take your corporate strategy, they should drop all potential revenue streams and spend every waking minute on free updates to one game. Paid DLC and new games that people buy PAY for those free updates. I have been saying this for over a year as they are trying to compete with modders rather than focusing on the mechanics of the game. I would pay for game improvement DLC's but I will not purchase DLC's that modders could do even better. I've forgotten about this project:) I'm curious what hapens with it. Considering we havent heard anything in a LONG time, they might be working on it after ATS comes out. Really need much more spaces for images. 6 isn't near enough. Good to see you impriving WOT! Keep up your great work. Do you plan to connect WOT and Steam accounts? That would be awesome. Also, linking your gameplay stats from your profile to WoT. Thank you for the update.... all your trucks are so beautiful.